DIY & Dragons: I2TO - Never Tell Me the Odds! ... actually, wait, please DO tell me the odds! Let me back up. Chris McDowall of Bastionland is writing a combined rules / setting book for running Into the Odd (I2TO) in his fictional city of Bastion. In support of this setting, he's also written a truly excellent list of failed careers for starting characters. These are fantastic, and aside from the generally terse, evocative writing, there are two things about the list that stand out. First, they fully capture the mood of Bastion as a bureaucratic labyrinth full of petty middlemen, where there's no job too lowly or too demeaning that there's not somebody stuck doing it, probably with an overly self-important supervisor breathing down their neck the whole time. And second, these careers are decidedly failures. You're not just someone who failed at their job, you're someone whose job itself was a failure, your job that should never have existed in the first place. You would have been failing even if you'd done it perfectly, which was probably impossible, because the task you were given was probably misconceived from its very inception. Seriously, go read his list of careers. I'll still be here when you get back. Okay, so given a list of 100 careers, my inclination would be to roll a d% dice and just scroll down that master list. It's the DCC way! 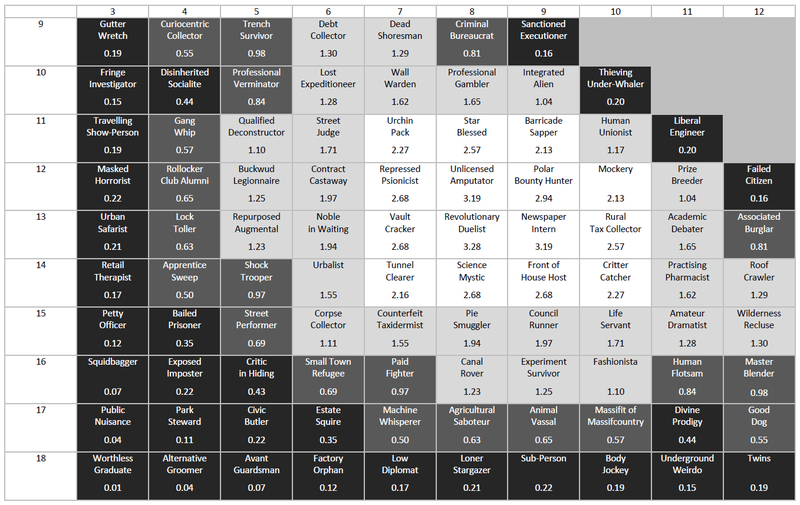 Chris shows off the failed career ability score matrix in a preview video for his new book, and I've reproduced the image below. Which brings me back to my original question - what ARE the odds? What I mean is, what are the chances of getting any one of those failed careers as your starting occupation? If you roll a d% dice on a 100-item table, it's easy - each occupation has a 1% chance, and you have exactly the same chances of getting any one of them as you do of getting any other. But in I2TO it's not so easy. Because you're not equally likely, for example, to have a high score of 15 and a high score of 17, which means you're not equally likely to get careers from one row or column versus another. If you knew how likely you were to get each ability score as your highest or lowest, you could cross-multiply and fill in each of the hundred cells in the table. (You can do that with a d10 by d10 table representing a d% as well, it's just that every cell along the top and side has a 10% chance of appearing, and when you cross multiply 10% by 10% you get 1% every single time.) Unfortunately, it's also not so easy to figure out the chances that this or that will be your highest or lowest score - even using AnyDice's "at least" and "at most" features. It's so not easy, in fact, that I didn't figure it out. I asked for help, and Brian Ashford from the Ominosity blog stepped up to answer my question. (Edit: Brian had the same question I had, and got his friend Jamie Prentice to help solve the math. When I posed my question, Brian shared Jamie's answer with me.) I took the output he gave me and turned it into the table you see below. I can't independently verify that it's correct, (obviously) but basic sanity-testing shows that percentages add up to 100, and the careers that depend on the likeliest ability scores are themselves the most likely. In the table below careers that are more likely have a light background and black text, and the lighter the background, the more likely you are to end up with that career. Careers that are less likely have dark backgrounds and white text, and the darker the background, the less likely the career. I used 1% as the cut-point, so the more likely careers are the ones that you'll get more often than if just you rolled d%, and the less likely careers are the ones that show up less often than they would on a d%. Looking at the diagram reveals at least one surprise (it surprised me, at least). I expected that Chris would make the most ordinary and prosaic careers the most common, while making the more unusual stuff rarer. And sure, as expected, you're less likely to play as "a dog" or "a brobdingnagian giant" or "literally two characters for the price of one". But on the other hand, if everyone at the table got the likeliest characters, you'd end up with a gonzo party where one character's a psychic, one's a muppet, your spellcaster is either a science mystic or the priest of an alien god, and the last character is actually a whole group of kids stacked up under a trenchcoat. Meanwhile, occupations like "grad student", "ex-con", "orphan" (just one this time), and "poor kid from the country who moved to the big city to make it big" are much less frequent than I would have guess (much MUCH less frequent, in the grad student's case). Although I should note that if Chris changes the order of the careers as he moves from blog post to finished book, then some of what I've said here about which careers are most common could be rendered false. 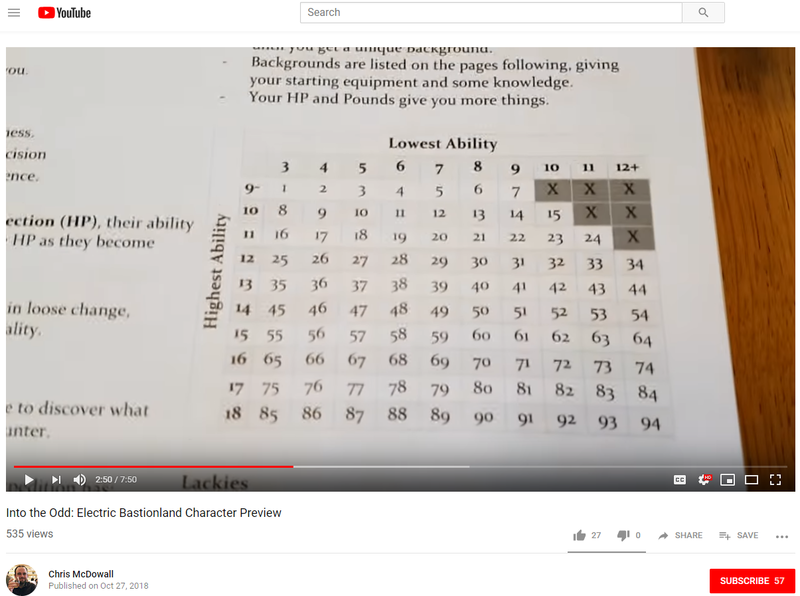 One final benefit of mapping out the odds like this is that any would-be designers out there who want to emulate I2TO's character generation mechanics can see how to arrange their own 94 classes to achieve whatever worldbuilding effect they're going for. As a designer, you can decide what you want to be most common, and with this information, put it in the correct location so that it actually will be.